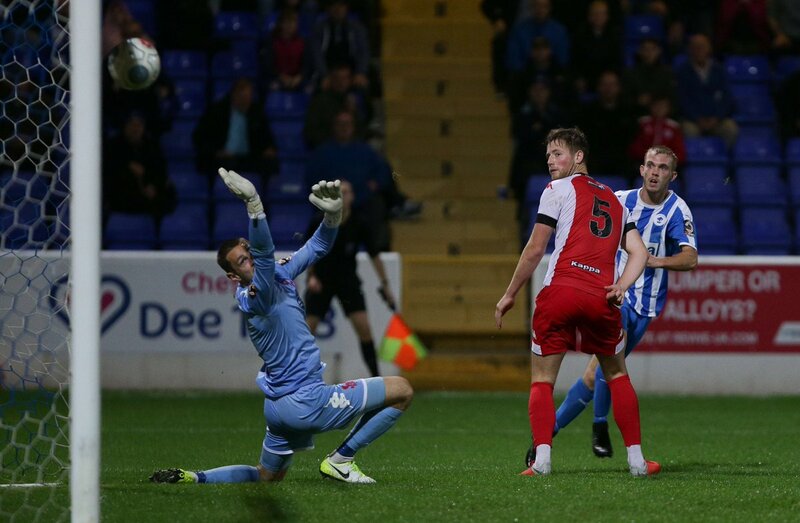 Chester FC put in a sublime performance to see off a previously unbeaten Kidderminster Harriers this evening. An Anthony Dudley penalty got things rolling, before Matty Hughes added a brace, with an Ed Williams penalty in between as the Blues looked confident against the leagues second placed side. 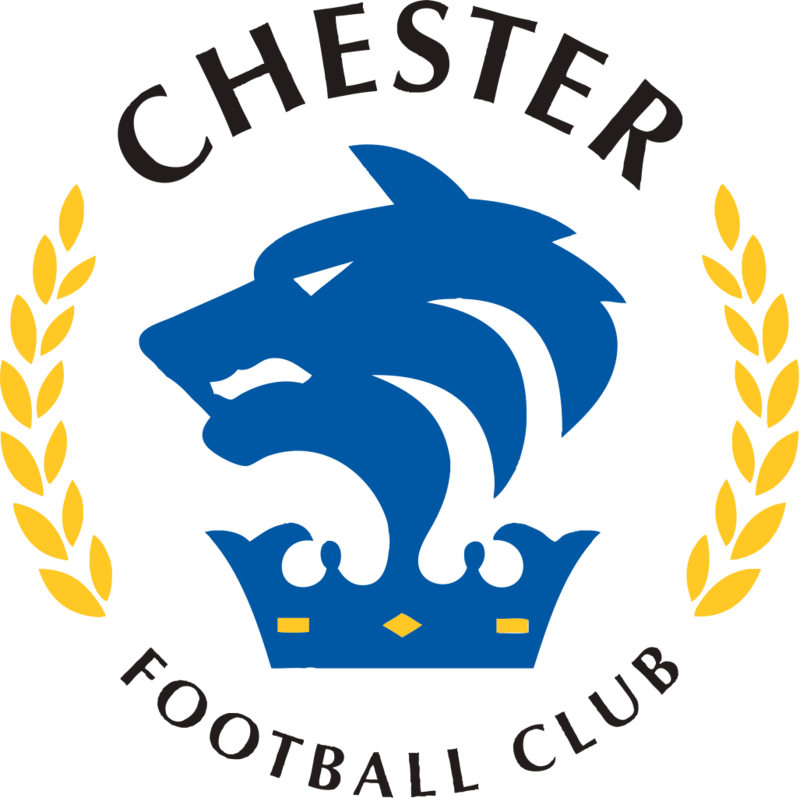 Chester’s pre-match preparations’s were thrown into disarray as captain Scott Burton pulled up with an injury, resulting in Iwan Murray making his senior debut, while Jon Moran replaced Dominic Smalley who picked up an injury at the weekend. The Blues got off to the perfect start, with Murray exchanging a pass inside the penalty area with Dudley before winning the ball back and being brought down, earning Chester a penalty. Dudley picked up the ball and coolly placed it to the left of Brandon Hall, giving Chester the early lead. Kidderminster started to improve going forward but it was the Blues who almost doubled their lead, Anthony Dudley capitalised on a defensive mistake and burst into the penalty area, but his low shot was wide of the Kidderminster goal. Chances were at a premium, with the visitors striking from the edge of the box with Billy Daniels and Ed Williams, but neither of the efforts tested Shenton. Both sides made a change at half time but it was the hosts who started the brighter, debutant Iwan Murray picking the ball up on the edge of the box and his curling effort couldn’t be turned home by Matty Hughes. It didn’t take Hughes too long to get his name on the scoresheet though, as Dan Mooney’s corner was scrambled away, with Hughes on hand to head home at the near post for his first goal since returning to the club. Kidderminster looked for an immediate response and almost found it. Joel Taylor did well on a surging run forward before cutting it back for substitute Dan Bradley, but his effort was inches wide, to the relief of the Blues. Chester almost extended their lead following a great turn from Stopforth, before finding Murray, who shot from thirty yards, with Brandon Hall only able to push the ball away. Moments later and Murray played through Matty Hughes, but Hall was on hand to make a good save. Kidderminster were handed a lifeline with just under twenty minutes remaining, a cross into the box caught the arm of Steve Howson, despite it being at his side and referee Michael Barlow pointed to the spot. Up stepped Ed Williams, who sent Grant Shenton the wrong way. Chester continued to look dangerous going forward, and following a good challenge on ex-Blue Kane Richards, they brought the ball forward again, Craig Mahon cut back well but couldn’t keep his shot down. The Blues restored their two goal cushion with just under ten minutes remaining through some fine solo work from Matty Hughes, the Blues forward picked it up out wide, cut down the byline and smashed it high into the roof of the net. Chester kept pushing for a fourth and very nearly got it after a short corner routine saw Mahon’s cross poked clear to Gary Roberts on the edge of the area. The Blues midfielder drilled an effort inches past the post. Chester: Shenton, Moran, Grand, Murray (Pritchard 77), Livesey, Howson, Mooney (Jordan 57), Stopforth, Dudley (Hughes 46), Roberts, Mahon. Kidderminster: Hall, Vaughan, Taylor, O’Connor, Horsfall, Digie (Richards 63), Weeks, Daniels, Ironside (Bradley 46), Chambers, Williams. Goal Scorers: Chester: Dudley (pen 6), Hughes (52, 81). Kidderminster: Williams (pen 72). Yellow Cards: Chester: Pritchard. Kidderminster: Chambers. Assistant Referees: Jake Topp, Tom Elliott.